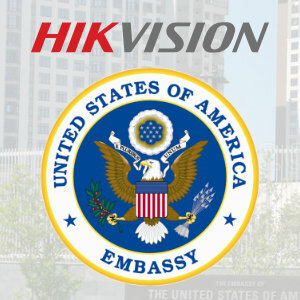 The US Embassy Ukraine specified 40 Hikvision cameras in 2017 despite Hikvision being removed from the US Embassy in Afghanistan in 2016. This raises significant security concerns, given Hikvision's Chinese government control andHikvision's IP camera backdoor. In this note, we examine the specifications and the issues involved. The U.S. Embassy in Kiev was attacked in June 2017 so the Embassy is certainly a high-security facility. Status of State Department Using Hikision Cameras? This raises the question of what is the State Department's stance on using Hikvision cameras. To their credit, when the State Department was notified of Hikvision cameras, they did remove them from the Embassy in question. However, the State Department's own records indicate that other surveillance systems are being specified using Hikvision cameras, including by the obvious high-security facility in Ukraine. Our goal in publishing this is to raise awareness so that State Department officials can prioritize reviewing the security concerns of such specifications.